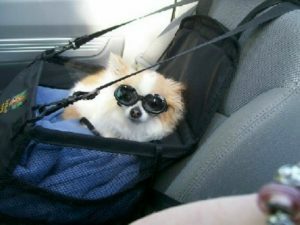 When traveling with our furry companion, it is important to do it safely. Just like humans, dogs can be seriously injured in car accidents. Here are a few tips we have compiled to make the ride safer for you and your pooch. 2. 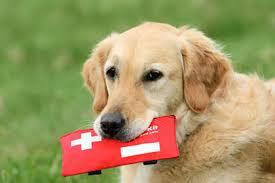 Always carry a pet first aid kit: include all the necessities for travel. Also be sure to keep interfere with your driving. It is also important so that in the event of an accident the dog is not thrown throughout the vehicle. There are several wonderful products that are designed for this purpose. 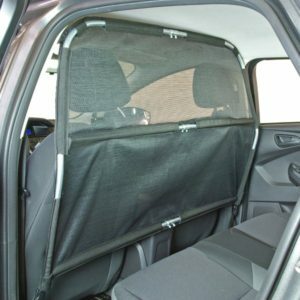 They include carriers, car dividers, and pet seat belts. your pet’s veterinary records, vaccination record, and dog behavior bio in a waterproof bag. This will aid rescue staff in the event you can’t answer any questions. 3. Limit your dog’s food before travel: Doggy nausea can be minimized if you do this. 4. NEVER EVER leave a dog inside a vehicle! This is extremely unsafe for your pet! Temperature rise quickly in a car and can kill a pet. Owners can also be punishedby law for leaving a dog unattended in a car. 5. You CAN NOT prevent a loose dog from being hurt in an accident. The force behind an accident can’t be stopped. You will not be able to restrain your dog just by holding them. Invest in safety gear for their protection. We love our doggy sidekicks and it is important to protect them to the best of our capabilities. With the use of restraint systems and the conscious practice of safety you can reduce the chances of you or your dog falling victim of car accident fatalities.